I told you that I wore LVX Legendaire on my toes for my wedding - it's definitely my new favorite luxury nail polish! I still love my mid-level and drugstore brands too, don't get me wrong but something about the big 5 free, vegan quality really makes me feel good about supporting this brand. I have this entire collection sitting on my desk to review and I promise to get to it - especially since LVX is branching out and adding shimmers! All images courtesy of LVX. The long lasting, chip resistant and non-streak formula is free of harsh and toxic chemicals. 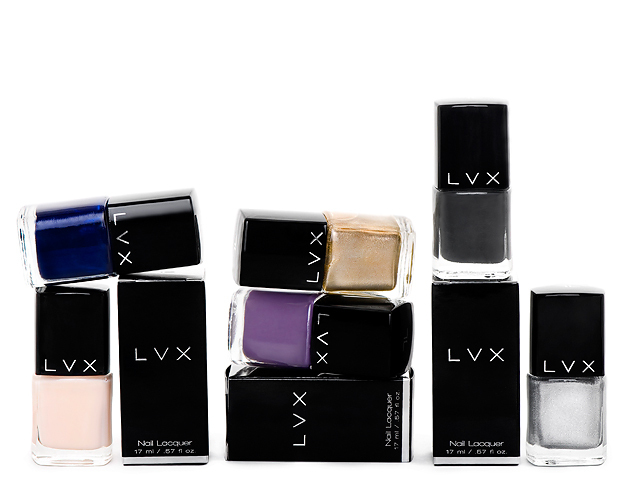 LVX products are VEGAN and formulated without the use of Formaldehyde, Formaldehyde Resin, DBP, Toluene, and Camphor. The brand is dedicated to providing top quality, socially responsible, and eco-friendly, luxury products without compromising quality, durability and finish. LVX nail lacquer is cruelty free. All products are produced in the U.S.A. The new collection will be available December 7, 2012 on www.shoplvx.com.